From the coastal vistas of Acadia to the back roads of Connecticut, here's where you should be road-tripping to this fall. By Madeline Bilis and Mary Meisenzahl·	 9/18/2018, 4:00 p.m.
New Englanders are pretty lucky living in one of the best places in the country for leaf-peeping and all. It’d be a shame not to take advantage of the vibrant display the region’s trees put on every year, especially when some of the most beautiful vantage points are only a few hours outside of Boston. 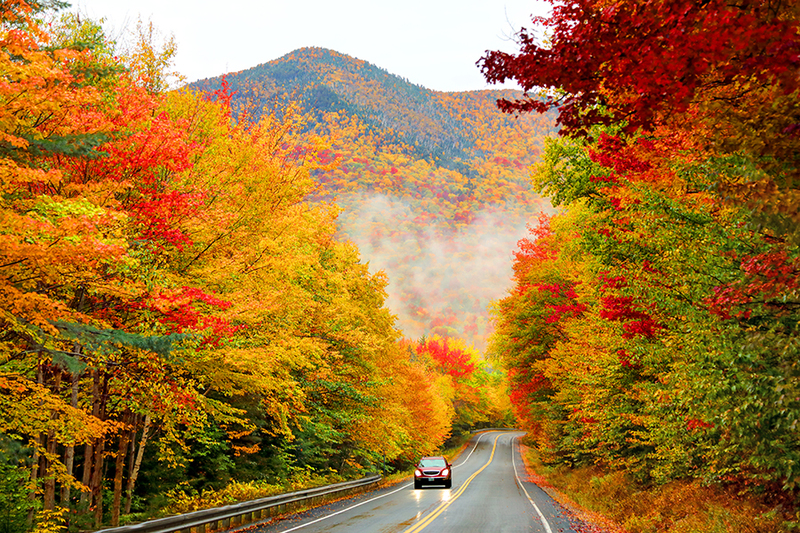 For your best leaf-peeping road trip yet, we’ve compiled 15 of the best foliage drives in Maine, Massachusetts, New Hampshire, Vermont, Connecticut, and Rhode Island. So pick a trip, consult this trusty interactive fall foliage guide, mark your calendar for peak colors, and set off with a full tank of gas. The entirety of the Mohawk Trail stretches 60 miles from Millers Falls, Mass. to the New York border, but you’ll want to wind through the 42 miles outlined here. The Mohawk Trail, or Route 2, was first used as a path for Native Americans traveling between the Hudson and Connecticut River valleys, according to Yankee magazine. Later, settlers traversed it on horses and wagons, and then, of course, it became a paved road. Today, the quiet country route passes through small towns, curves around breathtaking bends, and invites pause among drivers and bikers alike. You’ve gotta stop at…the Bridge of Flowers in Shelburne Falls. After only about 10 miles (or 20 minutes) into your drive, you’ll pass through this idyllic little town. Grab a parking spot and head over to the footbridge, which is draped with seasonal flowers. A note to November roadtrippers: the former trolley bridge is only open from April through October. Though it runs almost parallel to the Mass. Pike., Jacob’s Ladder Scenic Byway is nothing like it. Rather than rattling with 18-wheelers and Peter Pan buses, this 35-mile stretch of Route 20 is decidedly peaceful. 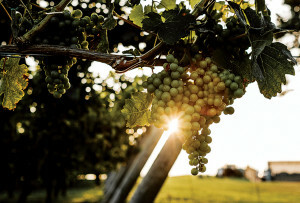 It slices through the heart of the Berkshire foothills, where you’ll discover both history and unspoiled beauty. Keep an eye out for keystone arches—these stone bridges were built in Middlefield, Becket, and Chester for railroads in the 1840s. You’ve gotta stop at…Chester-Blandford State Forest for a hike up to Sanderson Brook Falls. Walk for about 1.5 miles along an unpaved road to get there. 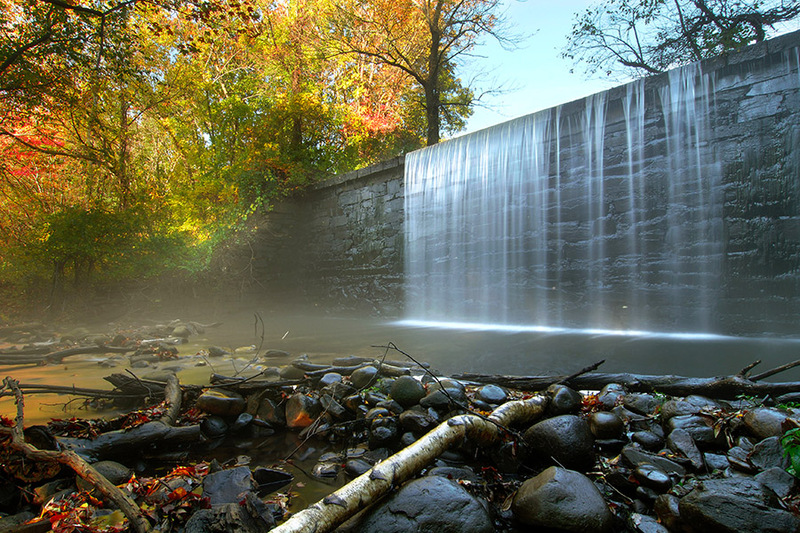 Waterfalls in autumn—what more could you ask for? OK, so this trip only lasts for about 15 minutes from end to end. 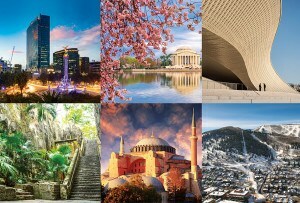 But it’s a close-by drive for history-loving city slickers, and presents plenty of opportunities to stop along the way. To make a day of it, start on Massachusetts Avenue in Lexington, and pull over at the Old Belfry, a bell that sounded the alarm on April 19, 1775, to mark the beginning of the Revolutionary War. Then, hop on Route 2A toward Concord, and park in a small lot on the right to see Paul Revere’s Capture site—the spot where Revere was arrested by British officers during his famed midnight ride. Once you’re back on 2A, veer right onto Lexington Rd. to pause at Louisa May Alcott’s Orchard House, the place where she both set and wrote Little Women. Finally, keep going to reach ever-charming Concord Center. You’ve gotta stop at…Main Streets Market & Cafe for lunch. The joint is overwhelmingly quaint, nestled inside a former grist mill. If you’ve worked up an appetite, the pulled pork mac & cheese grilled cheese sandwich is at the top of our list. Hit the road for the wilds of western Maine in mid-October to see reds, yellows, and oranges of all shades reflecting in Rangeley Lake. This trip crosses over the Appalachian Trail to trace the water’s unspoiled shores. First settled by rugged woodsmen who saw opportunity in the region’s abundant fish and lumber, the area now puts its ponds, streams, and peaks on full display every autumn. Take Route 4 to Route 17 to explore these 33,000 acres of protected wilderness. You’ve gotta stop at…the Height of Land. It’s the cherry on top of an already jaw-dropping journey (and has been called the most beautiful outlook in northern New England). 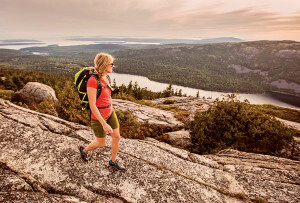 Though there are no signs to mark the pulloff, you won’t be able to miss the overlook when a panoramic view of Mooselookmeguntic Lake unfolds in front of you. Hop out of the car to see for miles—lakes, forests, hills, and the White Mountains can be glimpsed in the distance. Maine’s Golden Road stretches from Millinocket all the way to Quebec, but for the purposes of your leaf-peeping trip, you’ll only traverse the first 40 or so miles. Fuel up before taking the former logging route from Millinocket to Northeast Piscataquis at the edges of Baxter State Park, where you’ll weave through dense forests and past crystal-clear lakes. At the end of your drive, you’ll be rewarded with a view of Ripogenus Gorge, a mile-long canyon made up of 240-foot rock walls. You’ve gotta stop at…Abol Bridge, just after the Abol Bridge Campground & Store. It frames epic views of Mt. Katahdin in nearby Baxter State Park. 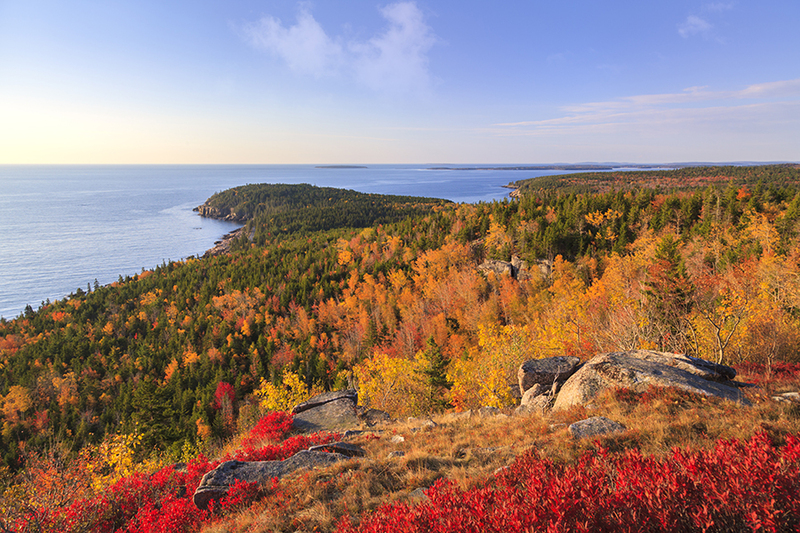 If you’ve never visited Acadia National Park, autumn is the perfect time to do it. Embark on a leisurely journey along the Park Loop, a 27-mile lollipop route that begins at the Hulls Cove Visitor Center. (Note: You’ll have to pay an entry fee.) Most of the route is one-way, framing watery vistas of shorelines and lakes, as well as mountains and forests. You’ve gotta stop at…Thunder Hole. Cross your fingers for a spot in the small parking area, then go explore the rock formation on the ocean. When waves come rolling in, they crash on the jagged inlet, sending sea foam spraying and loud, thunderous booms into the air. Take a trip through winding roads of the White Mountains on this often-mispronounced highway. (For the record, it’s “Kang-ah-mangus,” or “the Kanc,” for short.) In just 30 miles, you’ll cover rivers, ponds, mountain passes, and, of course, beautiful views. Begin your trip at the Saco Ranger Station before turning onto Route 16, where you can buy a parking pass that will allow you to stop at any of the forest service parking areas along the way. Because the mountains here vary in elevation, you can catch beautiful colors throughout autumn as the upper pass reaches peak foliage in late September, up to two weeks before the lower passes do. You’ve gotta stop at…Pemigewasset Overlook. This spot is the perfect place to watch the sunset and take in views of the Pemigewasset wilderness when it’s splashed in golden light. As you enjoy the expansive forest, you’ll find it hard to remember that the area was once heavily logged. Beginning and ending in Keene, this loop take you through some of the best foliage in New Hampshire, and with the option to stop in historic towns to boot. Take Route 101 to Marlborough, then head south on Route 124 and stop in Monadnock State Park, which features over 4,000 miles of hiking trails. Take a moment to drink in the unforgettable view of Mount Monadnock reflected in Perkins Pond. You’ve gotta stop at…Main Street in Keene. Whether you choose to stroll by the shops at the beginning or end of your foliage tour, you’ll be charmed by this town that claims to have the widest Main Street in the world. Definitely drop into Colony Mill Marketplace Antique Shop. This route invites you to marvel at stunning views of the Presidential Mountains, with plenty of excuses to stop and explore along the way. Take Route 2 west towards Jefferson, where you can finish your trip or continue on to Lancaster. Stretch your legs in Jackson, a quintessential New England town with a 1.5 mile-long walking loop, and set aside time to cross the historic Honeymoon Bridge on the Ellis River. You’ve gotta stop at…the Mt. Washington Auto Road. Drive to the highest peak in the northeast and take in panoramic views above the treeline for the ultimate foliage experience. You have no choice but to validate your experience by nabbing a “This car climbed Mt. Washington” bumper sticker before you go. 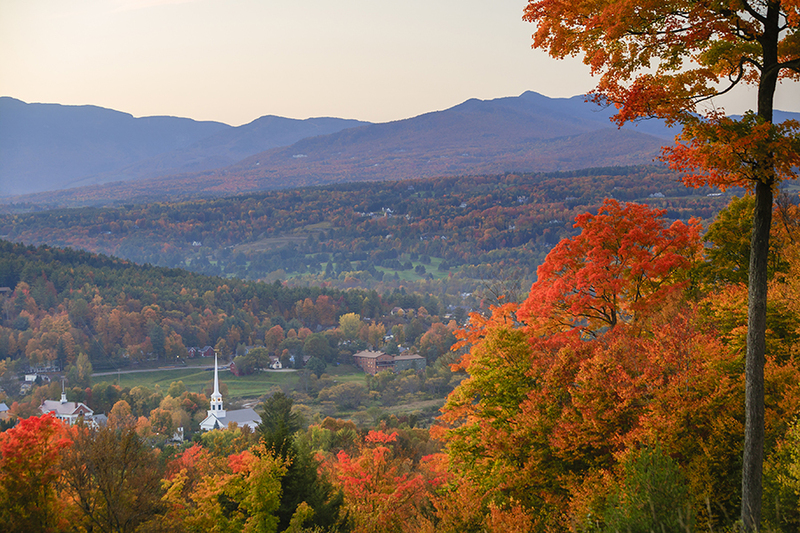 Let’s face it: Just about anywhere in Vermont counts as a “foliage drive” in the fall. But this byway is worth the trip. 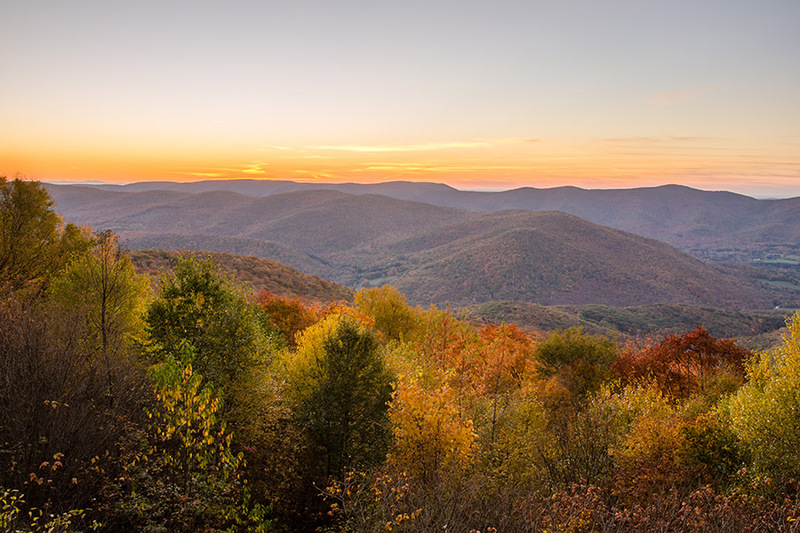 Drive through the spine of the northern Green Mountains to find scenic views of forests, waterfalls, and three state parks. The route takes you past Vermont’s highest peak, Mount Mansfield, giving you the chance to hike and take in the mountain backdrop. Be sure to drop by one of the many local farmers markets between Stowe and Waterbury to sample local offerings, or take a spin through the Ben & Jerry’s factory. You’ve gotta stop at...the Trapp Family Lodge. The von Trapp family, the inspiration behind the movie The Sound of Music toured the U.S. as a singing group in the 1940s before settling in picturesque Stowe, which reminded them of their native Austria. 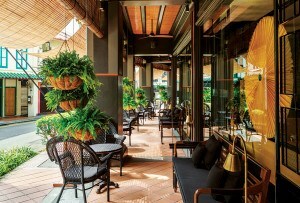 Today, the lodge has been updated into a 96-room resort. Stop by and have a drink at the onsite brewery. Start: Texas Falls, Hancock, Vt. 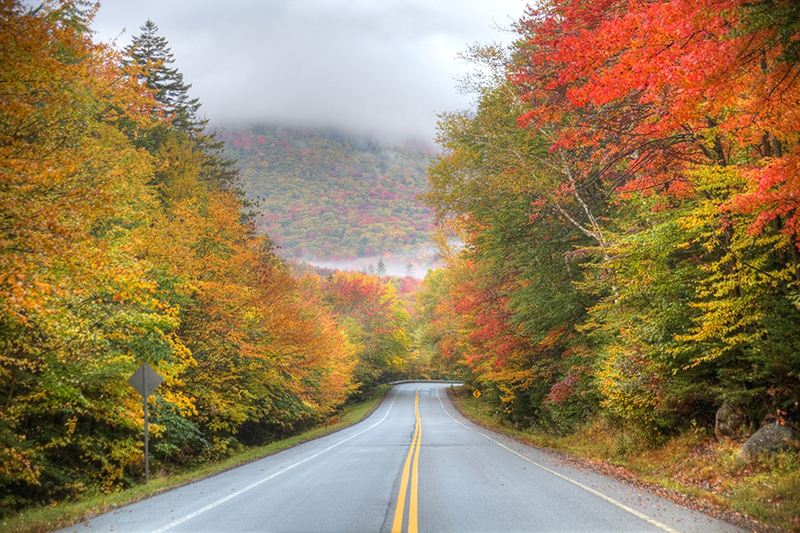 The Middlebury Gap is one of the most scenic routes in Vermont, a state known for its abundance of foliage. Start your trip in Texas Falls, and don’t cruise past the footbridges and rock formations just north of the road as you get onto Route 125. From there, you can pull over to hike the appropriately named Long Trail, which features 255 miles of paths up into the Green Mountains. 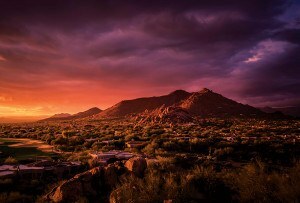 If you choose not to hike, you can still experience the wonders of the mountains as the route takes you climbing up the range and dropping back down into valleys. You’ve gotta stop at…the Robert Frost Interpretive Trail. Pull off the road in Ripton to explore the wooded trail that cuts through blueberry and huckleberry fields. There, you’ll cross a beaver pond to find Frost’s poems posted on the trees. At only a mile long with no steep inclines, this trail is perfect for visitors of all ages to take their time and absorb the natural landscape that inspired Frost. The Last Green Valley is a National Heritage Corridor on Route 169, meandering through a total of 35 towns. You’ll see some of the most pristine nature on the East Coast in this rural landscape that has remained mostly forest and farmland. Explore wildlife preserves, hiking paths, and museums. If you’re interested in something a bit more unusual, there are several alpaca and bison farms in the area to visit. You’ve gotta stop at…the Benedict Arnold Trail. At the beginning of your trip through Norwich, take a walk along the trail to see the home where the Revolutionary War general, and town’s most famous resident, was born. You can also see other historical homes dating back to the 17th century, an old schoolhouse, and a church. 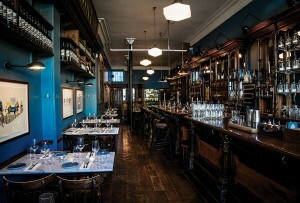 Quaint, indeed. 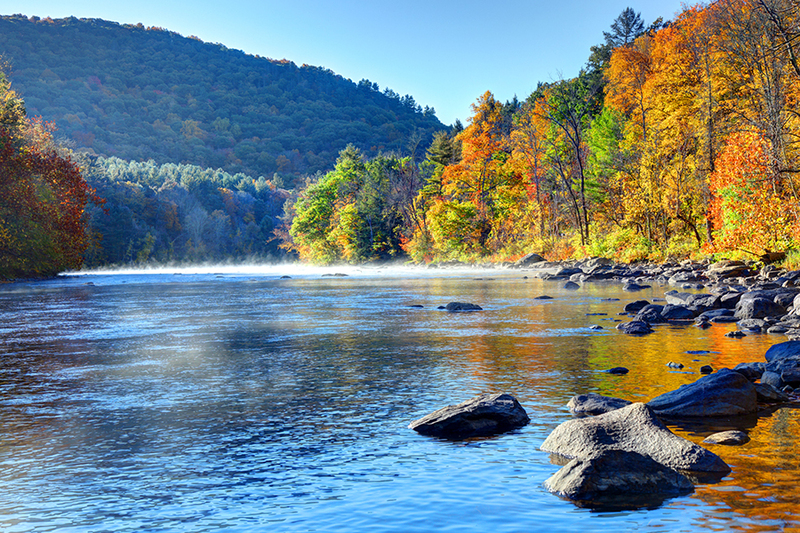 Follow the Housatonic River in western Connecticut for a view of the state’s best brightly colored leaves. As you drive through Kent, keep an eye out for the town’s two historic covered bridges off of Route 7, which were reconstructed to match the originals from the 1840s. You’ve gotta stop at...Iron Mountain Reservation in Kent. Hike the 1.5-mile trail through woodlands and see how many birds you can spot of the 27 species that live there. Start: Ocean Ave., Newport, R.I.
End: Castle Hill, Newport, R.I.
Drive or bike your way through the winding roads of Newport for dual views of the sparkling Atlantic and the foliage at Brenton Point State Park in its October peak. The park overlooks Newport Harbor, which means you’ll see some impressive sailboats docked in Narragansett Bay. It’s worth it to duck into a Newport mansion or two while you’re there. Ah, fall on the coast. Is there anything better? You’ve gotta stop at…the Cliff Walk. This 3.5 mile-long trail traces the rocky coastline of Newport, offering top-notch views of Jamestown Island. Start your tour at Memorial Boulevard, and watch out for steep drop offs. Journey through northern Rhode Island and southern Massachusetts to experience the impressive views and historic sites of the Blackstone River Valley. Known as the birthplace of the American Industrial Revolution, this scenic drive offers the opportunity to tour Slater Mill in Pawtucket. Visit the Museum of Work and Culture in Woonsocket to learn about the lives of millworkers. You’ve gotta stop at…the Great Road Historic District in Lincoln, Rhode Island, where you can step inside a Quaker meeting house, several mills, and a tavern.